Home › Publisher Catalogs › D.B.S. With the searching capability of DBS ” Torah Treasures ” you improve your learning ability and broaden your knowledge in Torah. Two small disks contain an entire wall-to-wall library in searchable text files. When learning, writing a paper, or preparing a lecture, you are able to find the needed material instantly and easily. The built-in ultra-fast search engine will locate in seconds even the most sophisticated subjects. A whole library of over 600 books is always available at your fingertips. 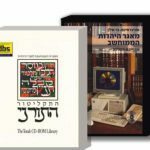 Torah Treasures ” is intended for use by: Rabbis, scholars, teachers, students, educators, speakers, writers, researchers, community and school libraries, and anyone studying and interested in classical Jewish books. Thousands of people already use it with great satisfaction. התקליטור התורני – מבית די. בי. אס מחשבים, הוא בשורה אמיתית לכל מי שזקוק למידע תורני נרחב וחפץ למצוא אותו במהירות וביעילות.